With his second one-on-one summit with Kim Jong Un coming up, Trump is certainly taking US policy in Asia in some new directions. But at home, it’s generating pushback on both sides of the aisle. Massachusetts Senator and 2020 presidential contender Elizabeth Warren’s first major foreign policy speech (and accompanying Foreign Affairs article) blasted Trump’s foreign policy, which she argues is “undermining … crucial alliances with Japan [and] South Korea.” At the same time, the New York Times notes a “growing chorus of Republican critics for Trump’s foreign policy,” with Republican hawks particularly concerned about Trump’s upcoming summit with North Korea’s Kim and what concessions he may make to the DPRK. This congressional action, aimed at reassuring allies across the region of US commitment, is also squarely in line with American public opinion. In a trend that predates the Trump administration, Americans have become more likely say that the United States should place a higher priority on building up strong relations with traditional allies such as Japan and South Korea, even if this diminishes US relations with China. Today two-thirds of the public (66 percent) back this position, up from a low of 53 in 2012. Conversely, support for building a new partnership with China, even if it might diminish US relations with traditional allies, has fallen over the same period (26 percent, down from a high of 40 percent in 2012). And in an era of widening polarization, this embrace of America’s Asian allies is a rare example of growing bipartisanship among the public. In 2010, Republicans were notably more likely to favor strong relations with traditional US allies, while Democrats were split between embracing those allies and seeing a new partnership with China. Today that gap has vanished, with two-thirds of Republicans, Democrats, and Independents all saying the US should focus on building strong relations with allies like South Korea and Japan. The public is also moving in the opposite direction of Trump when it comes to US military bases in Asia. The administration’s recent year-long fight with South Korea over host-nation support raised the prospect that Trump could order a withdrawal of US troops from South Korea, a move that would be in line with his past rhetoric about the US military presence abroad. With the US seeking another round of negotiations, and little support among South Koreans for giving in to US demands, the threat of US withdrawal will continue to be a live issue under Trump. But any such withdrawal is counter to trends among the public, where support for US bases in Asia is on the rise. American support for US military bases in Japan has been steadily increasing for nearly a decade, and in 2018, reached an all-time recorded high. Today, 65 percent of Americans back long-term military bases in Japan, including majorities of Republicans (72 percent), Democrats, (65 percent), and Independents (61 percent). The rising support for military bases abroad is particularly notable among Democrats: from 2006 to 2014, they were divided over the issue. Public support for US bases in South Korea is even higher, with 74 percent of Americans in favor, and the trend is similarly upward. In sum, Congress and the public alike, across partisan lines, are rejecting with increasing strength the president’s approach to US allies in the region. 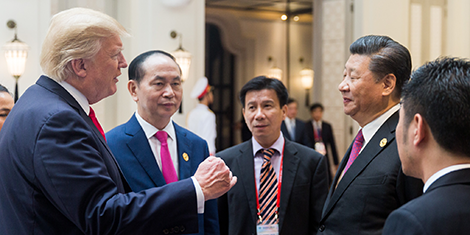 Trump and Congress are now taking contradictory approaches to the Indo-Pacific, resulting in a two-track policy agenda. Trump’s inability to persuade either Congress or the public to take his side in these disputes suggests that the Trump-style policy agenda toward US allies in Asia will not last beyond the Trump administration. Craig Kafura is a research associate for public opinion and foreign policy at the Chicago Council on Global Affairs, a Security Fellow with the Truman National Security Project, and a Pacific Forum Young Leader. You can follow him on Twitter @ckafura.